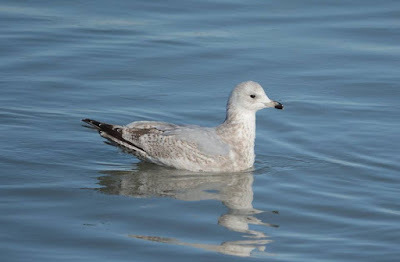 The putative Kelp x Herring hybrid is no other than "Gull Nasty", the Michigan City bird that has frequented the Indiana/Michigan lakefront for the last several winters. Chandeleur Gull (Kelp x Herring hybrid). 1st time observed in Illinois. Ken Brock tells me the bird went absent in early January, and now we know it's enjoying some time at the landfill some 70 miles to the southwest in Will County, Illinois. I last saw this individual in New Buffalo, Michigan back in early October. Slaty-backed Gull (adult). 1st Will County, Illinois record. String-of-pearls on p6-p8. No mirror on p9. 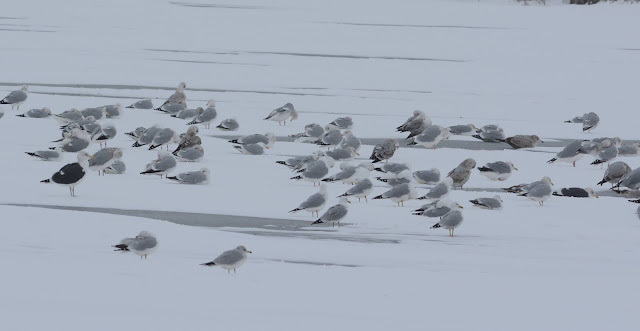 Chandeleur Gull (far left) & Slaty-backed Gull (far right at rest). The adult Great Lakes Gull (pink legs, thin white tips to the inner primaries) made a brief, but distant, appearance too, and for a brief moment I considered the possibility of a 2nd Slaty-backed Gull. I mentioned on North American Gulls that I pity the novice that shows up here trying to hastefully check off a SBGU - I meant that, literally. The black-backs here, especially when viewed at a distance are lots of "fun" to sort through. Extreme pale-end Herring Gull (2nd cycle). 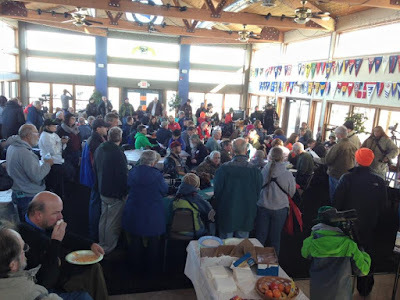 Gulls, birders and food. The 15th Annual IOS Gull Frolic was a great time yesterday. Birders from all around Illinois and beyond were in attendance. 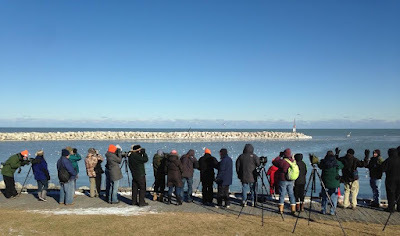 It was a frigid day, but despite that members were out in full force on the board walk, checking off all of our winter gull species (10 Thayer’s, 3 Iceland, 3 Glaucous, 4 Great Black-backed and 4 Lesser Black-backed Gulls among several hundred Herring Gulls). Adult Lake Michigan Gull (Thayer's/Kumlien's). 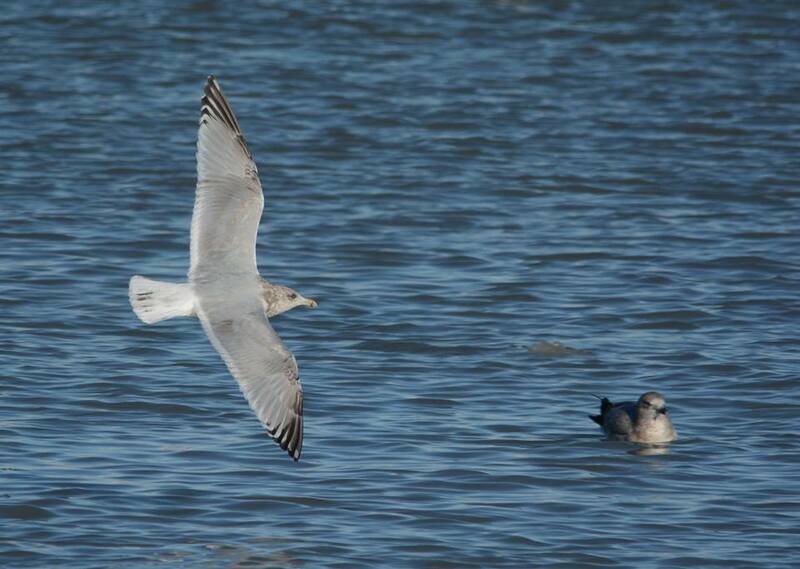 Adult Herring & Kumlien's Gulls. 3rd Cycle Type Herring and Thayer's Gulls. Lunch in the Main Room. 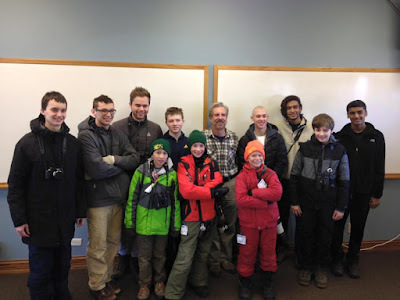 Illinois Young Birders posing here with the legendary Kenn Kaufman. 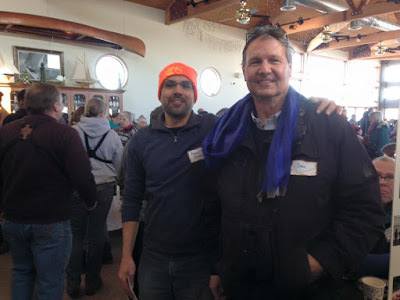 Amar Ayyash with one of the Gull Frolic pioneers, David B Johnson. Museum specimens from Chicago's Field Museum. Amar Ayyash, Kenn Kaufman and Joel Greenberg. A small sample of the 150+ birders in attendance. 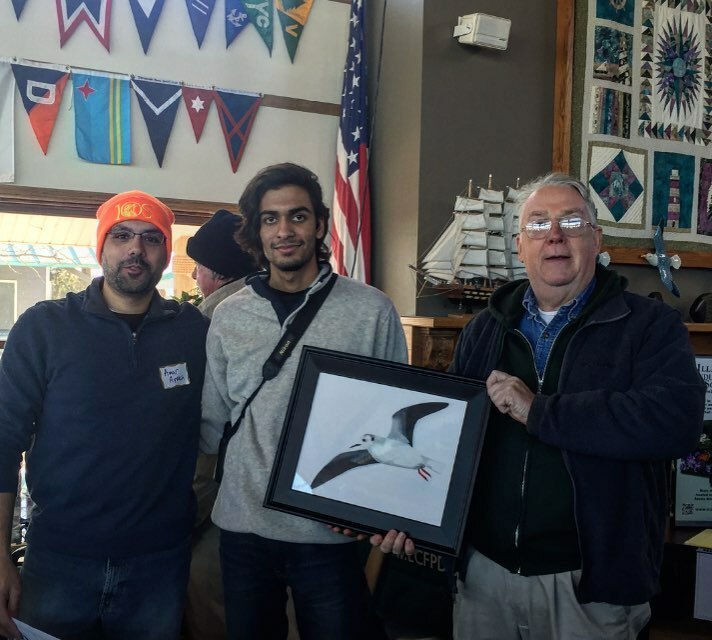 The 2017 Gull Frolic will be on February 11th. Mark. Your. Calendars. Appledore Gull is the title I've suggested for putative American Herring x Lesser Black-backed hybrids. They appear to be increasing with rapidity and it seems every week I'm being sent photos or someone is posting good candidates of this combination. 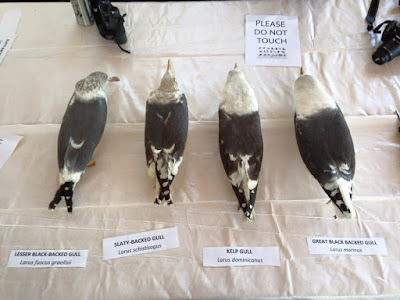 There are two individuals that have provided us with some insight: "Green F07" and "Green F02", the offpring of an American Herring and Lesser Black-backed Gull (Green F05) from Appledore Island in Maine. This is the most well-documented hybrid available to us in North America. Interestingly, this bird has kept mostly yellow legs in 4th basic. It's easy, then, to discredit the notion that adult F1 hybrids should have a blend of dull pink and yellow legs. This bird has been missing in action since 2nd basic. It looks much more like a 2nd cycle Lesser than a Herring (or an intermediate bird for that matter). Both size and the gray upperparts don't scream Herring Gull to my eyes. Green F05. 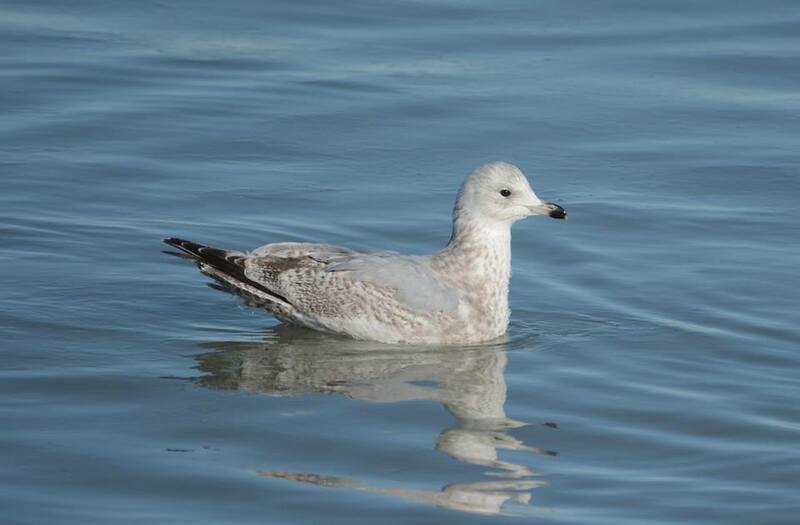 Banded on Appledore Island after found hybridizing with American Herring Gull. its winters in the Daytona Beach Shores area. More here. While in Florida a couple of weeks ago, I found two examples of adults that I feel make good candidates of this hybrid combination. Let's start with the more obvious individual. I base my identifications of these two birds primarily on two points: intermediate upperparts and corrupted leg color. P-molt is better for a LBBG at this time of year. The head/bill on both birds look more like Herring Gull, to me. The continuing barrier of little data and few known-age, known-provenance birds makes our identifications tentative. There is no known "hybrid zone" where we can openly observe this mix, and so the range of features in these hybrids is reduced to guesswork and imagination. This presents several critical identification problems for North American observers: 1) Identifying Yellow-legged Gulls with confidence, 2) Confusion with dark-backed "Herrings" and pale-backed "graellsii". Ivory Gull (1st cycle). St. Louis County, Minnesota. 01 January 2016. 12th State Record. 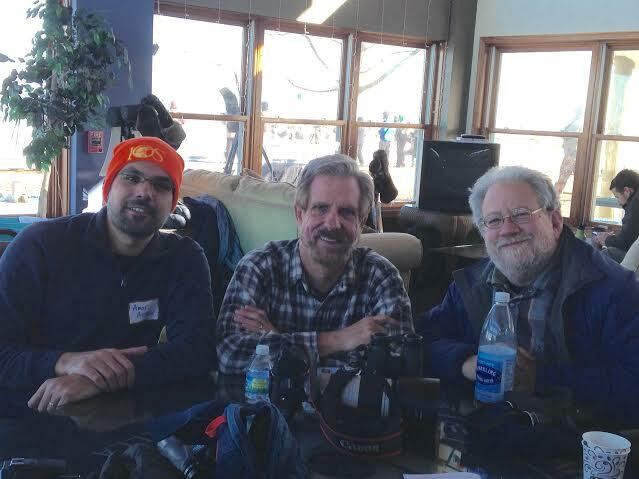 Took a 6 day absence, only to return to Canal Park on 15 January 2016. It was last seen on 24 January appearing weak and on the brink of expiring. Mew Gull (1st cycle). Caddo County, Louisiana. 01 January 2016. Ivory Gull (1st cycle). Douglas County, Wisconsin. 05 January 2016. Just a few miles from the Duluth bird, this individual was found dead. A partial specimen was given to the Field Museum in Chicago. Slaty-backed Gull (adult). Pierce County, Washington. 06 January 2016. Slaty-backed Gull (adult type). Jefferson County, Wisconsin. 07 January 2016. Slaty-backed Gull (3rd cycle type). Walla Walla County, Washington. 08 January 2016. Kelp Gull (adult). Summit County, Ohio. 10 January 2016. Resighted after a ten day absence. Thayer's Gull (adult). Horry County, South Carolina. 11 January 2016. 1st State Record. Adult showing a single mirror on p10 and none on p9. Black-tailed Gull (3rd cycle type). Clinton County, Illinois. 11 January 2016. Mew Gull (sub-adult/3rd cycle type). Lorain County, Ohio. 12 January 2016. Ivory Gull (1st cycle). St. Louis County, Minnesota. 12 January 2016. Another addition to the Ivory Gull saga in St. Louis County this month. A 1st cycle was found in a backyard in Ely, MN, being mobbed by crows. It was picked up and looked after by rehabbers and then released shortly after. All this while the Canal Park bird was missing in action. No photos were taken of the Ely bird (some 100 miles north of Duluth) and so whether this is a 3rd Ivory Gull or not is unknown. Three days later the Canal Park bird did reappear. Iceland Gull (1st cycle). San Diego County, California. 18 January 2016. Mew Gull (1st cycle). Knox County, Maine. 18 January 2016. Vega Herring Gull (adult). Cameron County, Texas. 18 January 2016. Slaty-backed Gull (adult). Contra Costa County, California. 19 January 2016. Franklin's Gull (1st cycle). Volusia County, Florida. 19 January 2016. Vega Herring Gull (1st cycle). San Mateo County, California. 20 January 2016. Iceland Gull (1st cycle). Brevard County, Florida. 21 January 2016. Common Gull (adult). Dartmouth, Nova Scotia. 25 January 2016. Slaty-backed Gull (adult). Solano County, California. 25 January 2016. Thayer's Gull (2nd cycle). Northampton County, Pennsylvania. 26 January 2016. Black-headed Gull (adult). Vancouver, British Columbia. 26 January 2016. Slaty-backed Gull (adult). Will County, Illinois. 26-29 January 2016. This same individual was found some 70 miles to the northeast at Montrose Harbor in Chicago on 30 January 2016. It was observed for about an hour before it flew off to the north, not to be seen again. This is now the 20th gull species seen at this site. Thayer's Gull (adult). Cecil County, Maryland. 27 January 2016. Slaty-backed Gull (adult). Milwaukee County, Wisconsin. 30 January 2016. Photo comparisons suggest this is a different adult than the one observed earlier in the month in Johnson Creek, WI and the individual observed in Illinois. Sabine's Gull (1st cycle). St. Vincent's, Newfoundland. 31 January 2016. A rare sighting from land. Exceptionally rare in North America in winter.